Unlike the dusty desert colors of Jerusalem and its surroundings, Galilee is fresh, green, and beautiful. Orchards and fields lie everywhere, the silvery leaves of olive trees shimmering with every passing breeze. The village of Nazareth, where Jesus grew up, is right in the heart of Galilee, up on a long hill known today as the Nazareth ridge. From below, Nazareth lies hidden, nestled in a hilltop valley. But from above, the view is magnificent. From the north rim of the valley just above the town, you can see all the way to snow-capped Mt. Hermon on a clear day. 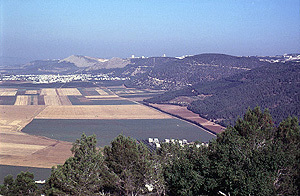 From the south rim, atop a rocky cliff, you can see over the widespreading Jezreel valley all the way to Mt. Carmel, where Elijah faced the prophets of Baal. This solitary perch provides a commanding view of the battlefield of the ages, where Deborah and Barak faced the Canaanites and Saul battled the Philistines. 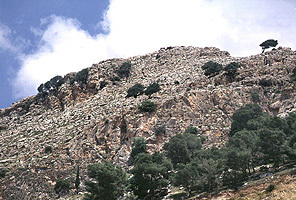 Imagine the interest that would put in your Bible study lesson: to take a group of young students on a hike up these rocky slopes to this magnificent view, and point out the very sites where so many dramatic Biblical events took place. We can be sure Jesus came here as a boy, either with Joseph or with his class from the synagogue school. Over here to the left, someone would have pointed, Gideon fought the Midianites. Over there, to the right, King Josiah battled Pharaoh Neco. There, across the valley, Jezebel was thrown down, and from right to left across the entire panorama Elijah outpaced King Ahab's chariot. The armies of the centuries visited this valley--from the Assyrians and Babylonians of old to the army of Alexander the Great; and since the time of Jesus Crusader and Moslem armies, even Napoleon and the British under General Allenby. All fought in this valley or passed through here. But its days as a battlefield are not just in the past. The book of Revelation, which calls this the valley of Armageddon,* says that this will be the staging area for the final war of the nations against God and his Messiah (Rev. 16:16). The nations will be at a serious disadvantage: they'll be in Messiah's home turf. * In Hebrew, "Armageddon" means the "mountain of Meggido." Meggido was one of the Canaanite cities in the Jezreel Valley confronted by Joshua and later by Deborah and Barak. But the spot of this magnificent view came very close to being the place of Jesus' death. Late one Sabbath morning, he was marched out toward this rocky cliff to be thrown off into the Jezreel Valley below (Luke 4:29). * His sermon that morning in the synagogue had upset his fellow townsmen so much, they were ready to kill him. What had he said that was so offensive? He had compared them to the Israel of Ahab and Jezebel, a generation for which God had done no miracles because of its sin and disobedience (Luke 4:25-27). * Today, this cliff is called the "Mount of Precipitation" in the sense of a headlong fall, which Jesus nearly experienced here. The identification of the site is traditional, but supported by its steep slope and proximity to the ancient village. This was not the kind of teaching they wanted to hear. They were looking for a Messiah that would fight against their enemies, the Gentiles, not one that would judge his fellow Jews! By what right did Jesus speak to them like this? To their minds, only God was worthy to judge the hearts of men. And since they did not accept that Jesus was God, his words were blasphemy. The Biblical penalty for blasphemy was death by stoning (Lev. 24:14-16). But by Jesus' day, the rabbis had ruled that a stoning should begin by pushing the victim off a high place. * This innovation was probably made for humanitarian reasons: stoning is a long and painful way to die. ** If the fall didn't kill him, then a large stone was dropped on his chest. If that didn't kill him, everyone standing by picked up stones and threw them at him until he was dead (Mishnah, Sanhedrin 6:4). *This may be how Stephen, the first Christian martyr after Jesus himself, was killed (Acts 7:58). The tradition persisted for years that he died outside the north gate of Jerusalem (not the eastern "St. Stephen's Gate" shown today). Just here, not far from today's Damascus Gate, there is a steep, rocky cliff that may have been the city's ancient place of stoning (site of the present Garden Tomb and the adjoining bus station). This explains, too, why James, the brother of Jesus, was pushed down from a high place as the first step in his execution (Eusebius, History II.23). **A stoning at Jeddah in February 1958 went on for more than an hour before the victim was dead. But when they arrived at this hill, for some unknown reason, Jesus simply walked away from the crowd that brought him here (Luke 4:30). The Bible doesn't explain why he was able to walk away so easily. Someone recently observed that the edge of the cliff is more than a Sabbath day's walk from the village (the maximum distance permitted to be traveled on a Sabbath--a little over half a mile). Had they gone to the edge of the cliff, those with him would also have become guilty of a capital crime. But whether for this reason or some other, Jesus' death was postponed to a later time. This experience didn't stop Jesus from pronouncing judgment against his fellow Jews. "Woe to you, Chorazin! Woe to you, Bethsaida!... It will be more tolerable for Tyre and Sidon [pagan, Gentile cities] in the day of judgment than for you..." (Matt. 11:21,22). Later, he pronounced judgment against Jerusalem when he prophesied its destruction (Matt. 23:37,38; Luke 19:42-44). In the Jewish and Biblical view, all judgment ultimately belongs to God. Human judges were therefore considered agents of God, exercising a holy office. This is why the seventy judges appointed by Moses in the desert had the Holy Spirit distributed to them: to help them exercise their office (Num. 11:16-17,25). In the same way, the seventy member Sanhedrin Council, the ideological descendant of these early judges, was believed to exercise divine authority. * Messianic prophecies were occasionally applied to it by the Rabbis (Psa. 89:38 in Ecclesiastes Rabbah 12:7, in Judah Nadich, The Legends of the Rabbis I, 1994, p. 166). *70 members plus the high priest acting as president of the council. The composition of the Sanhedrin as remembered by the rabbis is somewhat different than that reported by Josephus and the New Testament. But all agree as to the basic size and authority of this council. This is why the kings of Israel, who also served as judges, were anointed for office, and sometimes referred to as sons of God. * Unlike our modern separation of the judiciary from the executive branches of government, judgment was considered a right of kings, and one of their chief duties. This explains the title of the seventh book of the Bible: the book of Judges. These were not judges in the modern sense, but rulers over the people, which also gave them the right to judge their disputes. * In prophetic anticipation of the Messiah (Ps. 2:7, 89:26,27). When Jesus says, in Matthew 19:28, that the twelve apostles will sit on twelve thrones judging the tribes of Israel, this means that they will rule over the twelve tribes of Israel. In the same way, when Paul says that the believers in Messiah will judge the world, this also means they will rule the world (1 Cor. 6:2, as in Rev. 20:4). Given this understanding, it's only natural that the Messiah, too, as the Lord's anointed king, has the right to judge. In Micah 5:1, the Messiah is called the "judge of Israel" in a verse that prophesies the torture and death of the Messiah. But far from being an ordinary human judge, his divine nature is also hinted here: "his origins are from of old, from the days of eternity" (Micah 5:2). The same understanding appears in Isaiah 11, another famous prophecy of the Messiah. Here, one of the primary responsibilities of the Messiah is to judge the people: "With righteousness he will judge the poor, and decide with fairness for the afflicted of the earth" (Isa. 11:3,4). For this he is given the anointing of the seven-fold Holy Spirit: "The Spirit of  the Lord will rest on him, a Spirit of  wisdom and  understanding, a Spirit of  counsel and  strength, a Spirit of  knowledge and  the fear of the LORD" (Isa. 11:2). This prophecy was fulfilled when the Spirit descended on Jesus at his baptism: a sign that he, as the Messianic king, is anointed to judge justly. One of the verses in this section posed a puzzle for the early Rabbis. How can the Messiah judge, they asked, if he does "not judge by what his eyes see" (Isa. 11:3)? The answer provided in the book of Revelation is the vision of a lamb having "seven eyes, which are the seven Spirits of God sent into all the earth" (Rev. 5:6): the Messiah (the lamb) will judge by the eyes of the Spirit--described with the same seven-fold nature as in Isaiah 11. But this will not be the quiet judgment of a courtroom. The Messiah's jurisdiction extends to the day of God's judgment of all the earth: the Day of the Lord, in which God will destroy the wicked. In that day, the Messiah "will strike the earth with the rod of his mouth" (Isa. 11:4) to destroy the nations in rebellion against God. Since the office of king and judge are one, this righteous war against the nations will also be a judgment of those nations. Psalm 2 uses the same image of judgment: the "rod" of the Messiah will strike the nations, smashing them "like pottery" (Psa. 2:9). * Here the Messiah is called the Son of God with words similar to those quoted by the Father over Jesus at his baptism: "You are my Son" (Psa. 2:7; see Matt. 3:17, Luke 3:22, etc.). This is followed by a prophecy of the universal reign of the Messiah--and a hint to the salvation of the Gentiles (the nations): "Ask of me, and I will give nations to be your inheritance, and the ends of the earth to be your possession" (vs. 8). *The word often translated "Anointed" in Psa. 2:2 is "Messiah" (which means anointed) in Hebrew. In Isaiah 51, God's judgment is accomplished by his "arms": "My arms will judge the peoples and for my arm they will wait expectantly" (Isa. 51:5). 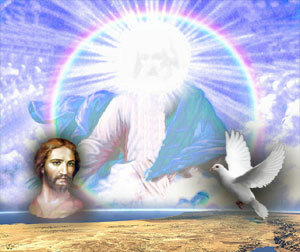 The two arms of the Lord, together with the Lord himself, are a beautiful picture of the tri-unity of God. The Father, whose arms they are, is now removed from the earth because of the sin of mankind. This is the message of the Temple with the ark of God inside, symbolizing the Father's immediate presence, but hidden behind a veil ("your Father in secret," Matt. 6:6). If he were to reveal himself now, in the fullness of his holiness, all would be destroyed because of their sin ("man cannot see me and live" Ex. 33:20). But because of his great love for us, he continues to reach out to us with his two arms--the Son and the Spirit--who, in their often hidden way, draw us to himself. The identity of the "arm" for whom the peoples "wait expectantly" (in Isa. 51:5) is made clear in Isaiah 53:1: "And to whom has the arm of the LORD been revealed?" This is the beginning of the famous Suffering Servant chapter, that talks about Jesus in such clear language, it is forbidden to be read in the synagogue as part of the annual cycle of Scripture reading: "He was pierced for our transgressions…. Like a lamb that is led to slaughter…. He will bear their punishments…." (Isa. 53:5,7,11). It can only be called divine justice that this same one who himself experienced such injustice will come to judge all mankind. When that day comes, Jesus warned, the doors of mercy will be shut (Matt. 25:10-12). But until then, they are open wide for all who would come to the everlasting arms (Deut. 33:27). We will all stand one day before the Messiah for judgment. But if we anticipate his coming, and welcome now the cleansing of the Word and the healing of the Spirit (Matt. 3:11; Eph. 5:26), we can wait with confidence for his return. Updated 4/16/08. Copyright © 2000, 2008 by Jeffrey J. Harrison. All rights reserved.